The School of Environmental Sciences is one of the longest established, largest and most fully developed interdisciplinary institutions of its kind in Europe. The School provides a stimulating, innovative and active research environment for the study of natural and human environments. Our fundamental and policy-relevant research informs the greatest societal challenge of the 21st century to balance human resource needs with the sustainability of our environment. 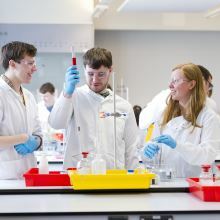 A world-class experience for researchers, postgraduates and undergraduates is provided by academics who are recognised as internationally excellent, supported by first-class teaching and research facilities based in our collaborative research centres and groups. In the 2014 Research Excellence Framework exercise, 35% of our research was judged to be world leading, while 53% was rated as internationally excellent. We are the 3rd placed department in the UK when ranked by the volume of world-leading research achieved and 5th placed in terms of research ‘power’. The impacts of our research were judged to be predominately world leading and ranked 1st in the UK, while our research environment was entirely world leading or internationally excellent. In 2005 the UK Government's Chief Scientific Adviser claimed that "The School of Environmental Sciences at UEA is the strongest in the world" and in 2008, the highly respected ENDS report identified the School and its roster of Environmental Science degrees as one of the most influential environmental organisations over the last thirty years. These claims are supported by more recent (2009-2010) citation metrics from Thomson Reuters placing ENV 5th in the world for Geosciences and 3rd in the UK for Environment and Ecology. In the most recent Teaching Quality Assessment, we were awarded an 'excellent' rating. In the latest employment figures, 88% of our undergraduates, who were available for work, found work or study within six months of leaving. Staff numbers given below are across an integrated environmental sciences department with about 50% of faculty having marine research interests.